You keep hearing, “Tell your story.” But how do you tell it in a way that makes a real impact? Going beyond storytelling: Discover the simple way to make your audience not only hear your story… but experience it! If you’re like most business owners, thought influencers, and other leaders and visionaries, you’ve undoubtedly heard many times that the key to engaging your audience (and getting them to agree with you) is “a good story.” There are countless coaches, authors, and marketers who tout this mantra. But if you’ve sat through more than a few story-based presentations recently, you know that most people’s stories fall flat. By the middle of the story, half the audience members are checking their phones and wishing the speaker would reach a conclusion fast… not so they can find out what happened, but so the speaker will finally leave the podium! If you’re lucky, you’ve also experienced the magic of an effective storyteller, too. Talented storytellers are great… but in order to make a real impact, you need to evolve past that to storyshowing. That’s when people stop realizing that they’re watching a speaker, and start becoming an integral part of the story – even feeling the emotions of the characters and the tension of the situation – right until the very last word. That’s exactly what storyshowing does. And that makes it easy for you to influence your audience any way you want! I’d like to show you how to master storyshowing… and craft immersive stories that are truly engaging! Hi, I’m Sam Cawthorn, and I’m excited you’re here. I hope that you’ll decide to take me up on my invitation to attend – completely free of charge – a game-changing event we’re holding near you. It’s called Mastering Storyshowing for Influence and Authority, and I think it’s going to be one of the best time investments you’ll make this year. This is the exact training that has helped me (and my clients from all over the world) develop high-impact stories that command attention from start to finish… and use those stories to create powerful change, build lucrative businesses, achieve celebrity status, and much more! I’ve developed a step-by-step approach to creating dynamic stories that don’t just tell concepts, ideas, and events… but vividly show them in a way that your audience simply can’t forget! 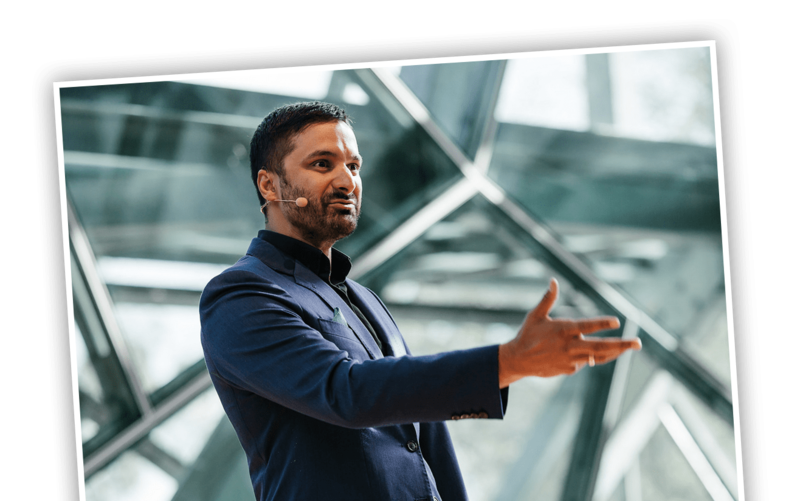 That approach has enabled me to command as much as $50,000 per speaking gig… and to launch a career that has allowed me to touch millions of lives through speaking, coaching, workshops and books. You can use the same approach in your own presentations. It doesn’t matter who your audience is, or what niche or industry you’re in – the simple dynamic storyshowing techniques and insights I’m sharing in this free program work. Why am I the right person to teach you how to craft and deliver amazing stories through storyshowing? Suddenly, you’re jerked out of your trance by a blaring horn. You look up just in time to catch a glimpse of a truck careening toward you, just meters from your window. When you open your eyes, you notice the antiseptic smell of the hospital room. Barely able to move, you squint to see the faces hovering over you. You feel quite lucky indeed. But when you try to reach out to those faces with your right hand… you realize that your arm isn’t there anymore. Now, how did you feel when you read that little vignette? Empathetic? Sad? Relieved? At different points, you probably felt all of those things. But the point is, you most likely felt something. And I bet that the next time you drive a car, you’re going to be just a little more cautious. That’s because the words I chose connect, engage, and immerse. In other words, they show, rather than tell. I’ve spent the past 7 years mastering the techniques that allow me to choose the perfect words that build effective, influential stories, full of visuals and emotions that truly hit home with your audience. I’ve learned from feedback which techniques work the best. And I’ve used them to help speakers from all over the world use stories to gain the influence and authority to generate business success, create social change, and much more. After joining my program, Maree McCabe not only became one of our Advisory Board members, but went on to become the CEO of Alzheimers Australia. Mark Bilton, a Fortune 500 C-Suite Executive, calls attending our program “a defining moment” that motivated him to be a best-selling author and executive coach. Pauline Nguyen completed the program and is now hailed as the #1 female speaker in Australia by the Speakers Bureaus. Warren Tate used what he learned in the program to launch a global career in speaking and authorship – he’s now known as one of the world’s leading authorities in auctioneering. Shivi Bhalla credits his phenomenal success to my program. At age 27, he is able to virtually retire – spending only one day each week working on his multi-million dollar business. Is Mastering Storyshowing for Influence and Authority right for me? You’re not interested in heightening the impact of your presentations and getting more “buy-in” from your audience. You’re the type of person who insists on “reinventing the wheel,” and you’d rather figure out how to make your presentations more effective on your own (even though that would take years). You’re a tyre-kicker who doesn’t use valuable information to improve yourself and your business. You just like going to workshops, and don’t plan to craft high-impact stories with what you learn. Or anyone else who wants others to pay attention to every word you say… and take the action you want them to take! Mastering Storyshowing for Influence and Authority is sponsored by the Speakers Institute, the premiere speaking organization in Australia and beyond. More than 4,000 professionals from nearly every industry have taken part in our trainings. And given the high-quality information and instruction we provide, it isn’t hard to see why. We’ve trained some of the best and brightest speakers in the country. We have ties with Google, Gallup, Microsoft, and many other well-known companies, and our Advisory Board is made up of some of the most successful leaders and CEOs in Australia. You’ll find out how to position yourself as a “go to” authority in today’s crowded business environment. You’ll learn how to quickly solidify your status as an industry expert and get your ideas heard. You’ll master the 16 hand gestures that keep your audience “dialed in” to your story. You’ll find out the subtle techniques that make your audience members put away their phones, stop chatting with their neighbors, and listen to your every word. You’ll learn how to use 5 non-verbal techniques to create more impact in your stories. You’ll find out why most “value propositions” can actually kill your business… and how to communicate your value instead. You’ll discover the 2 fundamental secrets of communication you can leverage to win new business every time. You’ll see how the subtle art of dynamic storyshowing can help you win more friends, influence more people, and make the kind of money you truly want. You’ll get a done-for-you blueprint for creating content that sells. You’ll learn how you can combine writing and speaking to create undeniable authority use can use to catapult yourself to success in any niche. You’ll find out how storyshowing masters package their content for optimum impact and maximum revenue. You’ll learn how to easily create your own super-attractive platform through storyshowing, so you can stand out, even in a crowded market. You’ll learn how to quickly and simply master your pitch to win over new clients and investors like clockwork. Plus, you’ll get the chance to network with like-minded speakers, entrepreneurs, influencers, thought leaders, executives, and more. The connections you make could have a dramatic impact on your success in business, leadership, or any other area of life. It took me years to master the art of dynamic storyshowing – and I made plenty of mistakes along the way. But I don’t want you to have to suffer through the same “learning curve” I went through when I was discovering how to make my stories more impactful. That’s why I’ve condensed what I’ve learned into a single day of profound insights, actionable tips, and made-for-you blueprints. And, because I have a deep desire to help others succeed, I’m bringing it all to a workshop near you (click the registration button at the end of this page for a list of dates and locations). You could figure it all out on your own, and learn from “trial and error” which techniques work and which ones fall flat. But why would you want to, when you can learn all the techniques you need to make your stories inspire, motivate… completely for free? Complete your registration while spots are still available. Although I’m not charging for attendance to Mastering Storyshowing for Influence and Authority, I do have to limit attendance to this event in each city. Part of that is because of space considerations – each event space can only hold so many people, and I don’t want to have to turn away attendees on the day of the event. So registering assures that you’ll have a seat reserved for you. The other reason is because I know from past events that there will be lots of questions. And while I can’t personally answer every question, I do want to make sure I can take as many questions as possible. And limiting attendance helps ensure that I’ll be able to get to yours. Seats for each city’s event do fill up quickly, so it’s important to lock in your spot while there’s still time. All you need to do is click the button below, select your event location from the list on the next page, and fill out the brief registration form. Once you submit your registration, you’ll get an email containing all the event details. Be sure to put the event on your calendar, too – I wouldn’t want you to miss the chance to get this empowering training absolutely free of charge! I look forward to meeting you at Mastering Storyshowing for Influence and Authority! P.S. : In case you’re thinking about skipping this event, think about this: Your competition is looking for ways to stand out from the crowd, just like you are. And, as people all over the world are realizing there’s more to influence than just telling a story, they’re looking for ways to improve their stories too. So what I’m telling you here is this: If you choose not to attend this event, you can bet that one of your competitors will be glad to take your spot.